Bishop of the East of the Ukrainian Orthodox Church of the USA, Chief Hierarch of the UOC-USA, and locum tenens of the Ukrainian Orthodox Bishops Outside of Ukraine. The new Holy Altar Table that is being consecrated today was built with great love and toil by Fr. Onisie Morar from wood he reclaimed from our old pews. This is a wonderful sign of the continuity of the parish through the fire. It is also a reminder, like the history of the Precious and Life-creating Cross, of how God works miracles through sacrificial hardship. The consecration service is always followed by a Hierarchical Divine Liturgy; today’s service will include the ordination of Sdn. Michael Abrahamson to the diaconate! It is worth noting that this will be the third ordination to the diaconate from within this parish in four years; this is to the Glory of God and speaks to the health and vibrancy of this parish. As with the construction of the altar, it also speaks to our continuity and blessing through tragedy: Dn. John Charest was ordained here just a few weeks before the fire (he grew up here and was ordained here, but now lives and serves in Chicago); Dn. Paul Cherkas was ordained during our “time of exile” while the church was being rebuilt, and now Michael Abrahamson is being ordained as part of the consecration of the church after our return! May the Lord grant our Metropolitan, His Eminence Antony, Michael and his family, and this parish of Saint Michael’s MANY BLESSED YEARS! Michael grew up loving the Holy Orthodox Church. He has many fond memories growing up at Holy Dormition parish in Cumberland. His Grace, Archbishop Job (then in residence there as OCA Bishop of New England), Fr. Stephan Meholick (then the priest at Dormition), and especially his grandmother Nadia Skorohod nurtured Michael’s love of God, the services, chanting, and fireside fun. He has been married to Faith for 18 years, and they have five children; Brendan (17), Betsy (16), Andrew (14), Justin (12), and Owen (5). He and his family have been regular members of St. Michael’s for seven years, with Michael serving as primary dyak/cantor for the parish and, for the last few years, as a member of the parish board. His favorite service (and many of ours, thanks to his efforts!) is the Vesperal Resurrection Liturgy of Holy Saturday. He graduated from the St. Stephen’s Diaconal program last year (the same “late vocations” program Dn. Paul, Dn. John, and Fr. Anthony graduated from) and is hoping to join Dn. Paul in taking the weekend “priestly formation” classes in the Fall. Every Orthodox altar should have relics embedded in the altar to join the parish into the living legacy of martyrs that have blessed the Church from the beginning. Up to this point, St. Michael’s has made due with just having relics in the cloth antimens we keep on our altar. Antimens is Greek for “instead of table”; it is the sign that the church is Orthodox, with a valid Orthodox bishop. Ours is signed by His Eminence Metropolitan Antony and contains the relics of the Great Martyr Barbara. Today, Metropolitan Antony will be sealing the relics of the Great Marty and Unmercenary Healer Panteleimon (martyred in 305AD) into our altar! PROTODEACON: Let us pray to the Lord. 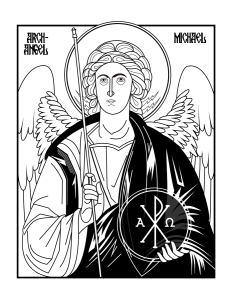 BISHOP: O Lord God, our Savior, Who creates all things and makes the race of mankind for salvation: accept the prayer of your unworthy servants, and enable us to present, at this present hour, to accomplish without condemnation, the consecration of this church built to Your praise and named for the Holy Archangel Michael and to Consummate the raising up of Your Holy Table in this place. For unto You are due all glory, honor, and worship; to the Father and to the Son and to the Holy Spirit, now and ever, and to the ages of ages. Then, as Psalm 144 is sung, the bishop blesses the altar and sprinkles it with blessed water. A rug and is spread before the Holy Doors and a cushion is laid in place (the Holy Doors being open). I shall bless Your name forever. His greatness has no bounds. They will tell of the magnificent glory of Your Sanctuary / And recount Your wonders. And speak of Your Majesty. And take joy in Your justice. Long suffering and abounding in mercy. His mercies reach to all His works. May all Your Holy People bless You. Your reign from generation to generation. Holy in all His deeds! He raises those who are down-trodden. And You give them food at the proper time. Holy in all of His works. To all who call to Him in truth. He will hear their prayer and save them. But shatters all the sinners. May all flesh bless His Holy Name forever and unto ages of ages. BISHOP: Blessed is our God always, now and ever and unto the ages of ages. The Lord is my shepherd / I shall not want. He restores my soul / He leads me in the paths of righteousness for His Name’s sake. Yes, though I walk through the valley of the shadow of death / I will fear no evil for You are with me. Your rod and Your staff / They comfort me. You prepare a table before me / In the presence of my enemies. You anoint my head with oil / And Your cup intoxicates me, for it is strong. Until I come to dwell in the House of the Lord forever. SPECIAL NOTE: We are in Paschaltide. Any references to kneeling and prostrations in this service book are superseded by the prohibition on kneeling and prostrations from Pascha to Pentacost. DO NOT KNEEL. PROTODEACON: Again and again, on bended knees, let us pray to the Lord. CHOIR: Lord, have mercy; Lord have mercy; Lord have mercy. Do You, the same immortal and generous King, call to mind Your bounties and Your mercies, which are from everlasting, and abhor not us who are defiled with a multitude of sins, neither annual Your Covenant because of our uncleanliness; but disregard our iniquities, and strengthen us with the Grace and inspiration of Your life-giving and Holy Spirit, that without condemnation we may accomplish the renewal of this Church, and fulfill the consecration of the Altar therein; that therein blessing You in Psalms, and songs, and mystical rites we may always magnify Your loving-kindness. Yes, O Master, Lord our God, the hope of all the ends of the earth, hear us sinners who make our supplications to You, and send down Your All-holy and Worshipful, and Almighty Spirit, and sanctify this Church and this Altar; Fill it with the light everlasting; elect it for Your dwelling place; make it the abode of Your glory. Adorn it with Your divine and supernatural gifts. Appoint it for a haven of the tempest tossed, for a healing of passions, for a refuge of the weak, for an expelling of evil spirits. Let Your eyes be open upon it day and night and let Your ears be heedful of the prayer of those who shall enter therein in Your fear, and in devoutness, and shall call upon Your all honorable and worshipful Name; that whatsoever they shall ask of You, You will hear it in heaven above and will show mercy and be gracious unto them. Preserve it indestructible even unto the end of the ages, and show forth the holy Altar therein, an Altar of Your Holy Things through the power and indwelling of Your Holy Spirit, Glorify it above the Mercy Seat according to the Law; that the holy offices which shall be celebrated thereon may attain unto Your holy, and most heavenly and super-sensual Altar and obtain for us the grace of Your most pure overshadowing; for we trust not in the service of our unworthy hands, but in Your unspeakable goodness. PROTODEACON: Help us, save us, have mercy on us, raise us up, and keep us, O God, by Your Grace. For the peace from above, and the salvation of our souls let us pray to the Lord. For this Holy House and for those that enter it with faith, reverence and fear of God, let us pray to the Lord. For our Metropolitan His Eminence Antony, for our Bishop, His Grace Daniel, for the honorable Priesthood, the Diaconate in Christ and for all clergy and people, let us pray to the Lord. For the work of our hands and our assembled brothers, let us pray to the Lord. For the sanctification of this Holy House and the Altar therein through the descent, might and works of the Holy Spirit, let us pray to the Lord. For this City and every city and land and for the faithful who dwell in them, let us pray to the Lord. For those who travel by land, sea and air, for the sick, the suffering and captives and for their salvation, let us pray to the Lord. Help us, save, have mercy on us, O God, by Your Grace. Remembering our most holy, pure, most blessed and glorified Lady, the Birth-giver of God and Ever-Virgin Mary, together with all the Saints, let us commend ourselves and one another and all our life to Christ our God. BISHOP: For holy are You, O our God, Who rests among the Saints and the Martyrs who suffered for You, and to You we ascribe glory, to the Father and to the Son and to the Holy Spirit, now and ever and unto the ages of ages. A ladle filled with warm water is brought to the bishop, along with the red wine and rose water. PROTODEACON: Let us bow our heads to the Lord. BISHOP: O Lord our God, Who sanctified the streams of Jordan by Your saving manifestation. Do You, the same Lord, Send down also now the Grace of the all; Holy Spirit on this Your present Altar and bless us and this water unto sanctification and completion of Your Holy Altar. For You are blessed unto the ages of ages. BISHOP: In the name of the Father and the Son and the Holy Spirit, now and ever, and unto ages of ages. Amen. O Mighty Lord of Hosts! My heart and flesh have rejoiced in the living God. the swallow has a nest wherein to lay its young. Forever will they praise You. In whose heart are the paths to Zion. For there the law-giver will give blessing. The God of gods will appear in Zion. Behold the face of Your anointed. One day in Your courts is better than thousands elsewhere; / I prefer to lie in the threshold of the house of my God than to live in the dwellings of sinners. God will give Grace and Glory. O Lord of hosts / Happy is everyone who trusts in You. BISHOP: Glory to our God unto the ages. BISHOP: Purge me with hyssop and I shall be clean. Wash me, and I shall be whiter than snow. Then the sacristan brings the sponges. The bishop takes one sponge and his concelebrants the others, and they wipe the Holy Table with the sponges. CHOIR: You will bring joy and gladness to my hearing, / and my humbled bones shall rejoice. And wash away all my iniquities. Fortify me with Your guiding Spirit. And the impious shall return to You. My tongue shall rejoice in your justice. But You take no delight in whole-burnt offerings. God will not despise a contrite and humble heart. that the walls of Jerusalem be rebuilt. Then You will be pleased with just sacrifices, offerings, and holocausts / Then they will offer calves upon Your altar. BISHOPS: Blessed is our God always, now and ever and unto the ages of ages. The bishop and clergy divest of the protective clothing. It is like the myrrh upon the head flowing down the beard; / The beard of Aaron. It is like the dew on Mount Hermon that flows to Zion’s mountains; / There the Lord has promised blessing and life forevermore. BISHOP: Let us go forth in peace. Your Church which in all the world, You have adorned with the blood of Your Martyrs, as it were purple and fine linen, cries aloud through them unto You, O Christ God! Send down your bounties upon Your People, giving grace unto Your Estate, and Great Mercy to our souls! The universe offers unto You, O Lord, the God-bearing Martyrs, the first fruits of nature, as to the Founder of creation. Through the prayers of the same, and of the Birth-Giver of God, O Merciful One, preserve in peace profound Your Church which is Your Estate. PROTODEACON (from before the holy relics): Again and again in peace, let us pray to the Lord. PROTODEACON: Help us, save us, have mercy on us, and keep us, O God, by Your grace. PROTODEACON: Remembering our most holy, pure, most blessed and glorified Lady, the Birth-giver of God and Ever-Virgin Mary, together with all the Saints, let us commend ourselves and one another and all our life to Christ our God. BISHOP (from before the holy relics): For holy are You, O our God, who rests upon the precious martyrs who have suffered for You, and unto You do we send up glory: to the Father, and to the Son, and to the Holy Spirit, now and ever, and to the ages of ages. BISHOP: O Lord our God, faithful in Your words and truthful in Your promises Who has granted Your holy Martyrs to fight the good fight and to fulfill the course of godliness and to keep the faith of true confession: You, the same all-holy Lord, hear their prayers and us, Your unworthy servants, to have a part and inheritance with them, that being followers of them, we also may obtain the good things which await them. Through the mercy and love toward mankind of Your Only-begotten Son with Whom Your are blessed, together with You All-holy, Good and Life-giving Spirit, now and ever and unto the ages of ages. BISHOP: Peace be with you all. PROTODEACON: Let us bow our heads unto the Lord. BISHOP: O Lord our God, through the intercessions of our Holy Lady and Mother of God and of all Your saints direct the works of our hands, Your unworthy servants, and make us worthy that we may in all things prove to be acceptable to Your goodness. Blessed and glorified be the majesty of Thy Kingdom, of the Father and of the Son and of the Holy Spirit, now and ever and unto the ages of ages. And in Your salvation, How greatly shall he rejoice! Honour and majesty have You laid upon him! The bishop then takes the censer from the protodeacon and censes the holy relics three times: and giving up the censer, the bishop, taking the holy paten with the holy relics, covered with an aer over the star, sets it upon his head, enters the holy altar, processes around the holy table and goes out through the holy doors, all the time supported by the chief priestly-celebrants. The bishop himself holds the paten with both hands. And thus they go forth, according to their rank. In front are borne the church banners and the icon of the church. After the icon goes the choir, then the priests, then the candle-bearer with the staff and the mitre. Then the protodeacon and a deacon go with censers and continually cense the holy relics and the bishop; and over the paten deacons (or subdeacons) bear the fans. Before the bishop, subdeacons (or servers) bear the trikiri and dikiri. Before them all walks a priest, blessing with holy water. As the procession commences, the choir sings hymns for the dedication, the martyrs, the holy relics, and the patron saint of the Church. The clergy and faithful, in procession with the holy relics circle around the exterior of the church edifice, exiting it from the western doors to the southern side, and so on circling to the east while the choir sings the tropar of the holy relics, the tropar of the church, and the main tropars of the Great Feasts of the Holy Church while a priest, going on before, sprinkles the church building itself with holy water. O Good One Who did found Your Church upon the rock of faith: Direct aright our petition therein, and accept the people who in faith, do cry unto You: Save us, O our God, save us! Supreme Commanders of the Heavenly armies; We, the unworthy, ever entreat that you; Surround us with the protection of the wings of your immaterial glory through your prayers. Preserve us who earnestly fall down before you and cry aloud: Deliver us from misfortune for you are the leaders of the Hosts on High. O Lord, the Confirmation of those who set their hope on You, confirm Your Church, which You have bought with Your Precious Blood. O Master and Creator of the vault of heaven and Founder of the Church: establish me in Your Love, O You Who alone love mankind; the summit of desire, the Confirmation of the faithful. You Who upon nothing, by Your command erected the earth and suspended it, hanging unsupported upon the rock immovable of Your commandment O Christ, establish Your Church, o You Who alone are good and love mankind. O Holy Martyrs, who have fought the good fight and have received your crowns; / Entreat the Lord that He will have mercy on our souls. / Glory to You, O Christ, our God, the Apostles boast, the Martyrs’ joy; // Whose preaching was the consubstantial Trinity. Then the bishop takes from his head the paten with the holy relics and sets it on the table prepared in front of the church doors. He venerates the holy relics three times. He then puts on his mitre and signs the priests on either side with the sign of the cross. CHOIR: EIS POLLA ETI DESPOTA! As the choir sings the tropar (O Holy Martyrs) as they enter the church. The doors are shut behind them. The priests stand before the doors with the holy icons, the Holy Gospel, and the Cross, remaining behind the table which is set directly in front of the doors. The clergy turn towards the west (with the bishop facing them). On the table is spread an altar-cloth and stand two or four candles. The fans are held over the holy relics. After the censing, the protodeacon takes the censer from the bishop, and censes the bishop thrice. BISHOP: Blessed are You, always, O Chirst our God, now and ever, and to the ages of ages. BISHOP: Lift up your gates, O you princes; and be lifted up, you everlasting gates, and the King of Glory shall enter in! CHOIR (from inside): Who is the King of Glory? BISHOP: Lift up your gates, O you princes; and be lifted up, you everlasting gates, and the King of Glory shall enter in. CHOIR (from inside): Lord, have mercy. The bishop’s mitre is removed, and he says this prayer in a loud voice. BISHOP: Blessed are you forever, O God and Father of our Lord Jesus Christ, Who through the veil of His flesh consecrated for us an entrance into the Church of the first-born, who are written in heaven, where is the abode of those who rejoice, and the voice of gladness; Do You the same Lord, Who loves mankind, look upon us Your sinful and unworthy servants who now celebrate the consecration of the honorable Church of the Holy Apostles after the pattern of Your most holy Temple – that is, of our own body which You gave to us – vouchsafed to us by Your all-laudable Apostle Paul to call Your Church and members of Your Christ; Establish it immovable unto the end of time and glorified in You alone. And count us worthy that without condemnation we may offer praises and exaltations here to Your glory, and to Your Only-begotten Son, our Lord Jesus Christ, and Your Holy Spirit with understanding, and with all our heart and that those who worship You in the fear of You may show themselves worthy of Your divine bounties; and that these prayers offered up by us and by all Your people unto Your ineffable loving kindness may be acceptable unto Your goodness: Through the prayers of our most holy Lady, the Birth-giver of God and Ever Virgin Mary. For You are holy, O our God, Who rests in the Saints. And to You we ascribe glory, to the Father and to the Son and to the Holy Spirit, now and ever, and to the ages of ages. CHOIR (from inside): And with your spirit. CHOIR (from inside): To You, O Lord. BISHOP: For to You are due all glory, honor, and worship, to the Father, and to the Son, and to the Holy Spirit, now and ever, and to the ages of ages. BISHOP: The Lord of Hosts, He is the King of Glory! CHOIR (from inside): The Lord of Hosts, He is the King of Glory! The table is set aside and the bishop sets the paten with the relics on his head; and, led by the chief celebrant, and bearing the holy relics, they enter the church. Forasmuch as You have shown forth the splendor of the firmament on high and the beauty of the holy habitation of Your glory here below, O Lord! Establish the same forever, and accept our petitions continually offered unto You therein; through the Birth-giver of God, O You Who are the life and the Resurrection of all men. Glory to the Father and to the Son and to the Holy Spirit., now and ever and to the ages of ages. Amen. Chief Commanders of God, Ministers of Divine Glory; Captains of the Angels and Guides of mankind: Ask for great mercy and that which is beneficial for us,; For you are the Supreme Commanders of the Bodiless Hosts. The Bishop enters the holy altar through the Holy Doors, and setting the paten with the holy relics on the holy table, he venerates the holy relics. The bishop’s mitre is put upon him. Then the protodeacon brings the censor to the bishop, and he takes it and censes the holy relics thrice times three, and his concelebrants on both sides. The protodeacon, taking the censor from the bishop, censes the bishop thrice. The bishop prays, blesses his concelebrants, and takes the aer and the star from the paten; and the sacristan brings the holy chrism, and the chest for the holy relics. The altar is prepared for the placement of the holy relics. The subdeacon brings the wax-mastic, which is somewhat cooled. The bishop takes the holy relics, unfolding them from the chest in which they have been wrapped, and sets them in three portions. The relics are encased in wax, and placed back in the chest, having first anointed them with the holy chrism; he pours on more of the wax-mastic and gives the chest to the sacristan. The sacristan, taking the chest and kissing the hand of the bishop, closes the chest, and places it in the special chamber in the altar. The altar is then prepared for anointing with holy chrism. The sacristan brings the holy chrism. The bishop anoints the holy table with the chrism in the form of a cross, three times: one in the middle and one on each side (where the Holy Gospel, paten, and chalice rest during the Divine Liturgy), a little lower down, saying three times at each: Alleluia. Then he anoints the columns of the holy table on two sides, and in the middle, and on the edges. PROTODEACON: Let us be attentive. And when the anointing of the columns of the altar is completed, Psalm 132 is sung again. BISHOP: Glory to You, O Holy Trinity our God, to the ages of ages. Remember David, O Lord. / And all his weaknesses. How he swore to the Lord / And vowed to Jacob’s God. I shall not enter my dwelling place / Or rest on my couch. My eyelids to close in sleep, my temples to have rest. A dwelling place for Jacob’s God. And found it in the woodland fields. And worship where his feet stood. You and the ark of Your Holiness. Your holy people will exult. turn not Your face away from Your anointed. The Lord swore truthfully to David and will not renounce it / I shall place the fruit of your loins upon your throne. these testimonies I shall teach them. Their sons also / will sit upon your throne forevermore. chosen it for His dwelling place. I shall dwell here because I have chosen so. I shall fill its poor with bread. and its holy ones will exult with gladness. and my Holiness will flourish in him. BISHOP: Glory to our God, to the ages of ages. The Lord has clothes and bound himself with power. He has made firm the world / Never to be shaken. The rivers have lifted their voices. The rivers will carry their roar from the sound of the great waters / Wondrous are the waves of the seas; Wondrous is the Lord on high. Your testimonies have proved exceedingly trustworthy / Holiness befits Your house forevermore. BISHOP: Blessed is our God, always, now and ever, and to the ages of ages. Then the bishop directs the first of the concelebrants to array the table of oblation with the sprinkling of holy water; and they set the sacred vessels upon it, and the coverings, and cover them, saying nothing, but only sprinkling them with holy water. Chief Commanders of God, Ministers of Divine Glory; Captains of the Angels and Guides of mankind: Ask for great mercy and that which is beneficial for us; For you are the Supreme Commanders of the Bodiless Hosts. My reliance in the Lord will never weaken. Stir up the feelings of my heart. I shall never hold with breakers of the law. And shall walk around Your altar, O Lord. And proclaim all of Your wonders. Nor my life as the bloodthirsty men. My foot stands on an even path; / In the congregations shall I bless You, O Lord. BISHOP: Glory to the Father, and to the Son, and to the Holy Spirit, now and ever, and to the ages of ages. Amen. And the protodeacon takes the censer and censes the bishop three times. Then he says the little litany in front of the holy table, to the left side of the bishop. PROTODEACON: Again and again in peace, let us pray to the Lord. BISHOP: O Lord of heaven and earth, Who with ineffable wisdom hast founded Your holy Church and have appointed the Order of the Priesthood upon the earth for an antitype of the Angels’ service in heaven. O munificent Lord, receive also us who now make our petitions unto You; not as being worthy to ask such great things of You, but that the exceeding excellence of Your goodness may be manifested; for You have not ceased in manifold benefits to be gracious unto mankind. And, as the chiefest of Your benefits, You have bestowed upon us the coming in the flesh of Your Only-begotten Son, Who was seen upon earth, and shedding forth the light of salvation upon them that sat in darkness, offered Himself as a sacrifice for us, and became a propitiation for the whole world, making us to be partakers of His Resurrection; and after that He had ascended into heaven. He endured His Apostles and Disciples, as he had promised, with from on high, which is the Holy Spirit, adored power and almighty, who proceeds from You, our God and Father; through Whom, also, they became mighty in deed and in word, administered Baptism unto the adoption of sonship, built Churches, established Altars, and instituted the laws and precepts of the Priesthood. And we sinners, having preserved these traditions, fall down before You, the everlasting and compassionate God, and implore You: Fill with Your divine glory this Church erected to Your praise, and show You the holy Altar set up as the Holy of Holies: that we who stand before it, as before the dread Throne of Your kingdom, may serve You uncondemned, sending up unto You petitions for ourselves and for all the people, and offering the bloodless sacrifice to Your goodness, unto the remission of sins both voluntary and involuntary, unto the governing of our life, the attainment of a good life and the fulfilling of all righteousness. For blessed is Your All-holy Name of the Father, and Of the Son, and of the Holy Spirit, now and ever and unto the ages of ages. BISHOP: We thank You, O Lord God of Hosts, for as you poured out grace on Your holy Apostles, and on our Venerable Fathers, and so willed to extend this even to us sinners, your useless servants, for the sake of Your great love for mankind. Therefore, we pray You, Most-merciful Master: Fill with glory and holiness and grace, this altar, that the bloodless sacrifices which shall be offered on it, may be transformed into the Most-pure Body and precious Blood of our Great God and Savior, Jesus Christ, your Only-begotten Son, for the salvation of all Your people and for our unworthiness. For You are our God, a God who shows mercy and who saves, and to You do we send up glory: to the Father, and to the Son, and to the Holy Spirit, now and ever, and to the ages of ages. At the conclusion of this, there is brought to the bishop a candlestick, and a new unlit taper, which the bishop lights with his own hands and places on the high place behind the holy table. Up to this point no tapers have been lighted in the sanctuary and from this flame all other tapers are lighted. BISHOP: O Lord our God, Who bestowed upon the holy Martyrs which suffered for Your sake this glory also, that their relics should be sown in all the earth, in Thy holy churches, and should bring forth fruits of healing. Do You, the Same Master, Who is the giver of all good things, through the intercession of the Saints whose relics You have graciously permitted to be placed in this Your venerable Altar, enable us without condemnation to offer unto You thereon the bloodless sacrifice: And grant us all those petitions which are to salvation, vouchsafing also to the relics therein of those who have suffered for Your holy Name, that they may work miracles unto our salvation. For Yours is the kingdom and the power and the glory, of the Father and of the Son, and of the Holy Spirit, now and ever and unto ages of ages. PROTODEACON: Again and again on bended knees, let us pray to the Lord. BISHOP: Lord our God, who by Your word alone created the world, leading it into existence, and who ineffably gave it various forms; who set Your Spirit hovering above it, and who poured forth the light of the sun upon it, for its renewal; who inspired Moses, Your servant, to add to your exceedingly good creation a certain special praise, and to say that You saw the light, that it was good, and called I day; by which also, seeing even this most radiant sun that every day renews creation, we glorify You, the Sun of the true day, and your never-setting light; who, though Your Son, commanded us to renew our nature by Your Holy Spirit, that, through his gifts the righteous may shine like the sun: We pray You, and we make supplication to You, the Father of the Word, our Lord and our God, forasmuch as, though Your ineffable love for mankind, and through Your boundless mercy, creation, and the ancient covenant (which was the image of the new covenant) in Your divine Revelation of Yourself on Mount Sinai, and in that wondrous bush that burned, and in the tent of witness, and in that exceedingly beautiful temple of Solomon, receives renewal: With merciful eyes look upon us Your sinful and unworthy servants who abide in this house like unto heaven, the boast of the universe, the true altar of your ineffable glory; and send down upon us, Your inheritance – Your Most-holy Spirit. And, according to the divine David, renew a right spirit in our hearts, and with Your governing Spirit, establish us. And grant to them that rule over us victories over enemies both visible and invisible, and to us, peace and concord. And give remission of sins to them that have diligently completed this building and the consecration of a church by Your word, granting to them such petitions as are for salvation. Stir them up to the fulfilling of your commandments; grant them the renewal of the gift of Your Holy Spirit, that uncondemned they may worship You, the only True God, and Jesus Christ whom You sent: Through the prayers of the Birth-giver of God, through the power of the Honorable and Life-giving Cross, and of all Your Saints. Amen. After the prayer the bishop rises, as do the others. BISHOP: For Holy are You, O our God, who rest upon the Holy and Precious Martyrs who have suffered for You, and to You do we send up glory: to the Father, and to the Son, and to the Holy Spirit, now and every, and to the ages of ages. Then the bishop with his staff in hand, goes to the place where he usually is vested (to the cathedra in the middle of the church), if there is such a place (or the ambon, if there is not). But if there is no vesting-place, he stands on the ambon in front of the altar. And the priests stand on either side, according to rank. And when the bishop has stood there and prayed, he blesses those present. DEACON: Have mercy on us, God, in Your great loving-kindness: we pray You, hear us and have mercy. Again, we pray for our Metropolitan, His Eminence Antony, for our Bishop, His Grace Daniel, for our brother presbyters, hieromonks and for all our brethren in Christ. 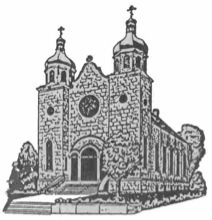 Again, we pray for our God-loving and God-protected country, the United States of America, for the Government and armed forces and for all the people; for our God-loving and God-protected ancestral homeland, Ukraine, for all of our ancestral homelands and their peoples, that the Lord God help and aid them in all things and protect them from every enemy and adversary. Again, we pray for the blessed and ever-memorable Orthodox Patriarchs, for the founders of this holy temple and for all Orthodox Christians departed this life before us, who here and elsewhere lie asleep in the Lord. Again we pray for mercy, life, peace, health, salvation, God’s visitation and the forgiveness and remission of sins for the servants of God (here prayer may be offered for the people with special needs) and for all the members of this holy temple: All-Merciful Lord, hear us and have mercy. Again we pray for those who bring offerings and do good works in this holy and all-venerable temple: for those who serve and those who sing: and for all the people here present who await Your great and abundant mercy. BISHOP: For You are a merciful and loving God and to You we give glory: to the Father and to the Son and to the Holy Spirit, now and ever and to the ages of ages. PROTODEACON: Lord have mercy, Lord have mercy, Lord have mercy. BISHOP: Most holy Birth-giver of God, save us. CHOIR: More honorable than the cherubim and beyond compare more glorious than the seraphim, in virginity you gave birth to God the Word, True Birth-giver of God we magnify you. The bishop ascends the ambon, and giving his staff, again takes the cross, and gives the dismissal with the cross. May Christ our True God , through the prayers of His all-pure Mother, through the power of the precious and life-giving Cross, through the protection of the honorable, bodiless Powers of Heaven, through the intercessions of the honorable glorious Prophet, Forerunner, and Baptizer John, of the holy, glorious, and all-laudable apostles, of the holy, glorious, and all-praised Apostle Andrew the First-called, founder of the Church in Ukraine, of the holy, glorious, and triumphant Martyrs, of our venerable and God-bearing Fathers, of the Holy Archangel Michael to whom this church is dedicated, of the holy and righteous forebearers of God, Joachim and Anna, and of all the Saints, have mercy on us, and save us, for He is good and loves mankind. After the dismissal the protodeacon proclaims the many years. The Great Litany, Antiphons, and Little Litanies. The first deacon leads the Great Litany. The other deacons lead the Little Litanies. During the singing of the antiphons, the remaining priests pairwise get the bishop’s blessing, enter the altar, kiss the Holy Altar, bow to the bishop, and take their places at the Altar. The Little Entrance. The senior priests make the Sign of the Cross and bow at the Altar, kisses the Gospel, turns, and bow as one to the bishop. Pairs of priests do likewise then line up for the entrance, from senior to junior. The senior priest and the first deacon again go before the altar, bow to it, and then turn and bow to the bishop for his blessing. The senior priest then gives the Gospel to the first deacon, who goes to the High Place and faces West. All exit from the altar for the Entrance in this order: Candle-bearer(s), Staff-bearer, deacons with censers, subdeacons with trikiri and dikiri, first deacon with the Gospel, and then the priests, according to rank (senior to junior). The procession circles the bishop, with the priests peeling off as necessary so that they end up arranged as at the altar, facing East. At the deacon’s prompting, the bishop blesses the Entrance and kisses the Gospel. The first deacon raises the Gospel above his head and proclaims: “Wisdom! Let us attend!”, then turns to face the bishop. The bishop blesses the people with the trikiri and dikiri as the clergy sing the Entrance Hymn (with the choir and people joining in halfway). They follow the bishop into the altar. The trio sings “IS POLLA…” while the bishop and deacon sense the altar. Trisagion (Holy God…). The choir sings it the first time, then the clergy, then the choir. The bishop goes out to the amvon to pray and alternates with the ladies trio. The clergy then sing “Holy God…” once more. The choir sings “Glory… now and ever… and finishes the Trisagion. The Epistle and Gospel Readings. After the readings, the bishop blesses the people with the dikiri and trikiri as the choir sings IS POLLA once. Litanies of Supplication, Departed, Catachumens, and the Faithful. The Great Entrance. The bishop goes out the Holy Doors where the subdeacon washes his hands. The bishop returns and completes the Proskomedia prayers and offerings. The procession is as follows: candle-bearer(s), staff bearer, deacon with miter, deacon with censer, subdeacons with trikiri and dikiri, servers with fans, first deacon with diskos, senior priest with chalice, then the remaining priests arranged from senior to junior. During the Entrance, the servers and priests break out symmetrically to end up with the senior priests nearest the altar. The first deacon commemorates the presiding bishop. The bishop takes the diskos and chalice in turn, offering his own commemorations. The priests then follow the bishop into the altar. The bishop blesses the people with dikiri and trikiri as the choir sings “IS POLLA”. The Litany of the Offering and Creed. The Anaphora (Eucharistic Prayer). The bishop blesses the people with the trikiri and dikiri saying “The Grace of our Lord Jesus Christ…” The anaphora proceeds as usual. After the bishop commemorates his hierarch, the deacon commemorates the bishop. The choir responds: “And all mankind” to both commemorations. The Ordination of Deacons. After the bishop has intoned; “And may the mercies of our great God and Savior Jesus Christ be with you all” the ordinand is brought to the bishop for ordination. He is led around the altar three times, then the bishop lays his hands on the ordinand and ordains him. Each of his vestments; stichara, stole, and cuffs, are presented to the deacon to the exclamation of AXIOS! Litany and the Lord’s Prayer. Communion of the Clergy and of the Faithful. The choir may sing pious hymns during the Communion of the clergy. The bishop goes out to the amvon to offer Communion to the people. Benediction and Homily. The bishop blesses the people with the dikiri and trikiri, proclaiming “O God, save Your people and bless Your inheritance.” The people respond with “IS POLLA” and “We have seen the True Light…” The Divine Liturgy concludes and the bishop offers his homily. The Many Years. The deacons offer petitions for our Church, hierarchs, clergy, and people; our countries and their peoples; and the newly ordained and their families. The Ordination is Over… Now what?! Now that we have participated in the ordination of Deacon Michael, we are obliged to place him, his wife Pani Faith, their children Brendan, Betsy, Andrew, Justin, and Owen, and their ministry to Christ’s Church foremost in our love and in our prayers. The diaconate brings many new challenges and temptations, some which are well known among the laity and others less so. It is always a blessing, but it can be hard. Our prayers will help sustain and strengthen Dn. Michael as he grows in this new ministry and, Lord willing, prepares himself and his family for the next order of holy orders, the priesthood.